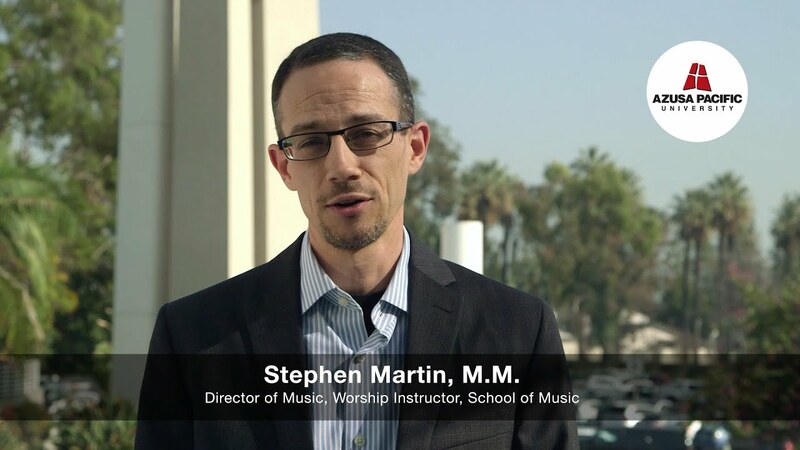 Stephen Martin has been active as an educator, conductor, composer, and music pastor for the last 20 years. He has arranged and scored music for film, symphonic orchestra, big band, vocal jazz, chamber groups, and has led over 300 volunteers in music ministry. As clinician and educator, Mr. Martin provides training in worship leadership, conducting, and composition. He currently serves as Program Director for the Music & Worship degree at Azusa Pacific University, teaching courses in worship arts leadership, arranging, and orchestration. A recipient of the Faith and Fine Arts Award in 2014, (APU College of Music & The Arts), a Faculty Fellow in the APU Center for Academic Service Learning (2015-17), and nominee for the Chase A. Sawtell Inspirational Teaching Award in 2018, Mr. Martin enjoys helping students connect vocation with faith, as they explore what it means to serve in the broader context of Christian community. Mr. Martin is currently completing a doctoral degree from Claremont Graduate University in Sacred Music, with an emphasis in Conducting. He holds a master's degree in Trumpet Performance from the University of Southern California, and a bachelor’s degree in Music Performance, Education, and Composition from Azusa Pacific University.